Dreaming of a GREEN Christmas: Thanks to President Trump, Dow Jones Smashes All-Time Record Highs — Condition Yellow: Stay Alert. Stay Alive. A few days ago, we brought you the low-down on just how much the economy has grown under President Trump's leadership. The facts don't lie -- Americans are doing better under thanks to the Trump administration. Just how good are we talking though? We're happy to report that this year, stockings will be filled and Christmas trees overflowing with gifts in light of the latest reports. The Dow ended up again today at another all-time high for the 70th time this year – breaking the record for the most all-time highs in a calendar year set in 1995. At the bell the Dow closed at its highest closing amount ever at 24,792. Since last year’s election the Dow is up over 35%! 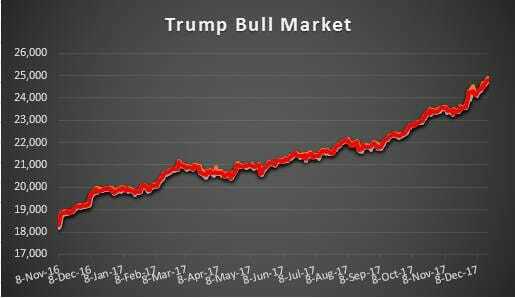 * The Dow has increased more that 6,400 points since the November 8th election a year ago when the Dow closed at 18,333. This is the largest point increase in this amount of time in Dow history. This has never happened in the more than 100 years in the Dow. Of course, not everyone is a super savvy investor with a swollen portfolio. The rest of us are asking "well, what about Trump's tax plan?" There's good news on that front as well. Under President Trump's revised formula, a single tax payer in Alabama earning $50k a year with no dependents will save over $1,100 in taxes this year. California? Same thing, leftists be damned! Don't believe us? Check out this handy calculator from Maxim Lott -- in just a few moments you too will know how much you'll save, thanks to the automated formula that does all the math for you. Lott is a supervising producer for John Stossel and a news writer for FoxNews.com. You can send him your feedback here.